Eight years ago, Volkswagen completely overhauled the midsize sedan to cater specifically to American buyers, with more interior space and creature comforts combined with the company’s signature fun-to-drive nature. 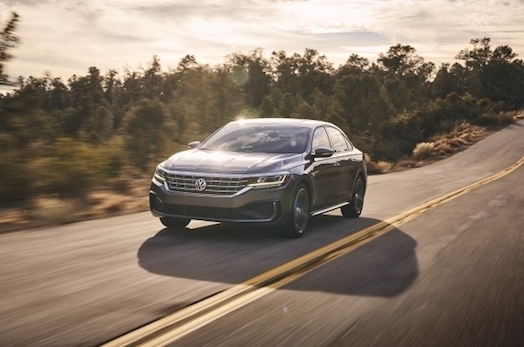 Building on the success of that model, Volkswagen of America today unveiled its new 2020 Passat at the North American International Auto Show in Detroit. Today’s new Passat offers more of what matters: bolder design, upgraded technology, and enhanced access to convenience and driver-assistance features. While the 2020 Passat retains the underpinnings of the previous model, it has been completely restyled. A dynamic coupe-like roofline, dramatic “tornado” line, and dominant grille give the Passat a bold new look — at once, elegant and sporty. Standard slim LED headlights and taillights, along with more prominent Passat badging that runs the width of the trunk lid, give the car a more premium look. Standard 17-inch aluminum-alloy wheels enhance the sophisticated design, and 18- and 19-inch wheels are available. Inside, the Passat combines a sophisticated new design and upgraded technology with the spacious cabin that made the outgoing model popular. The cockpit features a horizontal design, incorporating air vents that flow across the dash in a style reminiscent of premium models. A new, more contemporary instrument panel has been fitted, along with a new glass-covered infotainment touchscreen. Complementing the new interior design are new colors and premium materials. Three interior décor designs are available, based on trim. Volkswagen’s V-Tex leatherette and Nappa leather seating surfaces are available in addition to the standard cloth seats and offer four color options. Comfort, for both drivers and passengers, continues to be a key strength for the Passat. To help keep occupants comfortable, Passat offers available heated front and rear seats, power driver’s seat with memory, and dual-zone Climatronic automatic climate control. Convenience features include available power-folding, heated side mirrors with memory, the Adaptive Front-lighting System (AFS) with range control and cornering lights, auto-dimming rearview mirror, remote start, rain-sensing wipers, KESSY keyless access and push-button start, Voice Control, and Easy Open trunk. Infotainment technology gets a boost in the 2020 Passat. In addition to a new glass-covered touchscreen, MIB II Composition Media infotainment with SiriusXM radio comes standard (three-month trial subscription included) and Discover Media with navigation is available. Every Passat comes with standard Volkswagen Car-Net App-Connect technology, which integrates compatible smartphones with the three major platforms—Apple CarPlay, Android Auto and MirrorLink — making select apps accessible from the infotainment screen. For audiophiles, top-of-the-line models feature the Fender Premium Audio system. The 2020 Volkswagen Passat will be available in four regular trim levels and a launch-only Limited model. It is expected to begin arriving at U.S. Volkswagen dealers this summer. In addition, Volkswagen AG announced today that Chattanooga, Tenn. will be the company’s North American base for manufacturing electric vehicles. Chattanooga will be the first dedicated location in North America for production of a vehicle using Volkswagen’s modular electric toolkit chassis, or MEB. In addition to Chattanooga, Volkswagen is building the first dedicated EV production facility in Zwickau, Germany, starting MEB production by the end of the year. Volkswagen will also add EV-production at facilities in Anting and Foshan, in China, in 2020, and in the German cities of Emden and Hanover by 2022. “The US is one of the most important locations for us and producing electric cars in Chattanooga is a key part of our growth strategy in North America,” says Herbert Diess, CEO of Volkswagen AG.